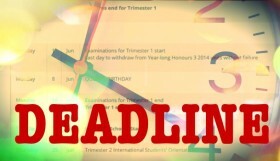 Monday 17 December is the Last day to withdraw from Trimester 3 and year-long trimester 2 units without failing them. Wednesday 19 December is also Census day for Year-Long 3 Units (spanning trimesters 3 and 1, 2019). Lectures will end for the mid-trimester break this Friday (21 December). Student Support will close on Monday 24 December at 4pm and re-open at 9am on Monday 2 January 2019. Have a safe and happy holiday season! Support Team for your assistance throughout the year. Thank You Warren. Have a wonderful holiday season.